Silicones, panthenol, and hydrolyzed silk go a long way to tame frizz and static and create silky strands. Careful--less is more with this! It does have a "masculine" scent, but that does dissipate with time. A bit pricey. People love it or hate it. If you find the right amount for your hair a little goes a long way. 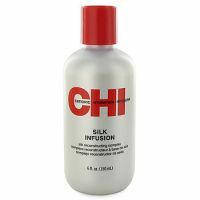 I first was introduced to this product back in 2007 after having got 3d highlights in my hair. My stylist recommended this to me and put some on my hair. I fell in love with the smell immediately and Loved how it made my hair look shiny and healthy. I have to use about 8 dimes sizes because my hair is long and Iove putting extra on my ends. I also massage my scalp with this product and for the pr...read moreice, which to me is actually pretty cheap. You can find it at Ross and Marshall's sometimes for half the price, so I stock up. I've tried using silkeness, pantene and other products, but this is by far the one I am faithful too. It is worth it if your hair is thinning, over processed, dry or you use a lot of heating products. I don't recommend it in places with humidity like Hawaii or if you have thick asian oily hair. It is made for caucasian hair mostly and unfortunately I am part Enlish so I have that white hair, so this is a life saver for me.